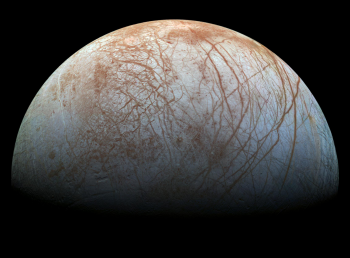 NASA has confirmed “statistically significant evidence” from the Hubble Space Telescope indicating the presence of salty watery ejecta plumes from the Jovian moon Europa. 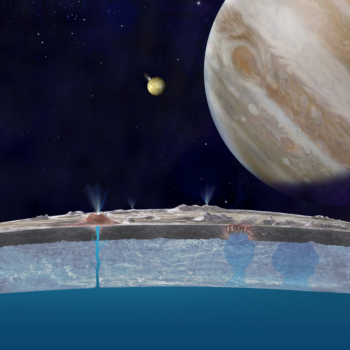 The announcement lends further proof for the existence of a deep, saline ocean under Europa’s icy surface and creates new urgency and objectives for NASA’s upcoming Europa Clipper mission in the mid-2020s. The new findings from NASA come after more than two years of analysis from a series of images and observations from the Hubble Space Telescope in 2014. 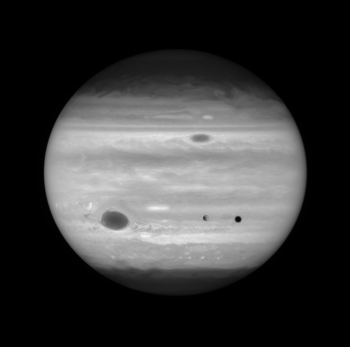 During the observation campaign, the Hubble telescope’s Space Telescope Imaging Spectrograph (STIS) observed Europa transiting in front of Jupiter, allowing the giant planet to serve as a backdrop to see if Hubble’s STIS instrument could detect a thin, tenuous, atmosphere surrounding Europa. Thus, the campaign was not actually looking for these water plumes – though possible plumes had been detected by Hubble before. 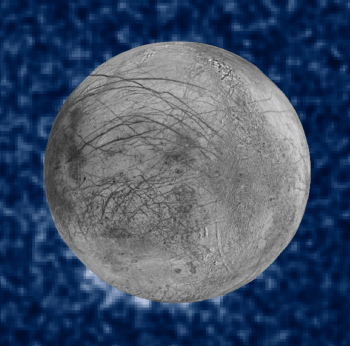 Given the great statistical probability that the plumes are what Hubble shows them to be (water) – with the investigative team noting that they can’t think of another natural explanation for what was seen in the Hubble observation – they lend great evidence to the leading theory that Europa harbors a saline, subterranean ocean. 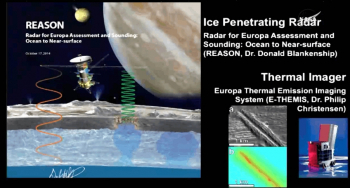 Moreover, given the upcoming Europa Clipper mission, the plumes represent a possibility that missions to Europa may be able to sample the moon’s ocean without having to drill through miles of ice – like Cassini has sampled Enceladus’ subterranean ocean by flying through those ejecta plumes. Thus, the plumes provide a tantalizing opportunity to gather samples originating from under the surface without having to land or drill through the ice. The new observations also and excitingly provide supporting evidence for water plumes on Europa first detected in 2012 by Lorenz Roth of the Southwest Research Institute in San Antonio, Texas. 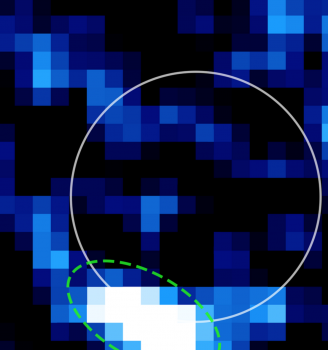 Roth’s team detected evidence of water vapor erupting from the south polar region of Europa – the same region the new 2014 observations saw water vapor ejecting from – and reaching more than 160 km (100 mi) into space. Importantly, as with all things in science, both teams used Hubble’s STIS instrument… but each used an independent method to arrive at the same conclusion: that the plumes are saline water. “When we calculate in a completely different way the amount of material that would be needed to create these … features, it’s pretty similar to what Roth and his team found,” said William Sparks, astronomer with the Space Telescope Science Institute in Baltimore. Thus, as scientists are wont to do, there is an element of extreme caution in today’s announcement. Regardless, Mr. Sparks noted that since 2014, his team has observed two more transits of Europa in front of Jupiter and that that data is currently under review. For today, the team noted that it took over two and a half years from the 2014 observations to come to today’s announcement because “we [took] the observation in time tag mode. And then we [had to] reconstruct the images from a timeline of about 50 million events,” noted Mr. Sparks. At this time, the team and NASA is hopeful that future observations from the STIS instrument on Hubble and the soon-to-be-launched James Webb Space Telescope will confirm venting or plume activity on Europa. “Hubble’s unique capabilities enabled it to capture these plumes, once again demonstrating Hubble’s ability to make observations it was never designed to make,” said Paul Hertz, director of the Astrophysics Division at NASA Headquarters in Washington. 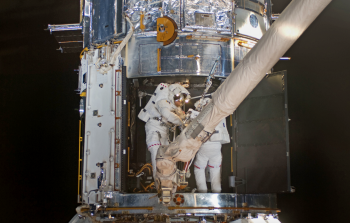 The observations by Hubble’s STIS instrument – it should be noted – would not have been possible were it not for NASA’s “heroic” flight of the Shuttle Atlantis and the STS-125 crew in May 2009 to upgrade and service the iconic telescope. The mission specifically worked on and repaired the STIS instrument. As noted in today’s press conference, “We’re thrilled about these findings because they were enabled from repairs of the STIS instrument by astronauts on STS-125. Because of that heroic repair, we’re making major discoveries like this one,” stated Jennifer Wiseman, senior Hubble project scientist at NASA’s Goddard Space Flight Center. First discovered on 8 January 1610 by Galileo Galilei, Europa is the smallest of the four Galilean moons and is currently the sixth known largest moon in the solar system. Europa was first observed by Galileo on 7 January 1610, but Galileo’s telescope could not discern it clearly from that of another Galilean moon: Io. 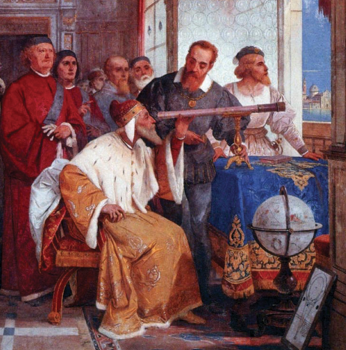 Galileo viewed Jupiter again the following night, and clearly observed Europa and Io as two distinct bodies; thus, 8 January 1610 is used by the International Astronomical Union (IAU) as the official discovery date for Europa. Named after the daughter of King Tyre and mother of King Minos of Crete in Greek mythology, Europa was one of Zeus’ lovers (Zeus being the Greek counterpart of the god Jupiter in Roman mythology). Europa itself orbits Jupiter at a mean orbital radius of 670,900 km in a short 3.55 day, believed to be tidally locked orbit. This tidal lock, however, presents one of the many interesting elements of Europa – as research and multi flyby investigations of the moon suggests that Europa actually spins ever so slightly faster than it orbits. This would give Europa a non-synchronous rotation that gives the outward appearance of a tidal lock orbit that isn’t actually tidally locked. 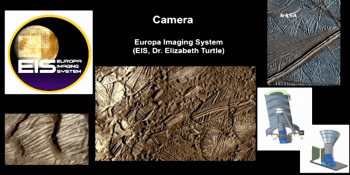 Regardless, Europa’s close orbit also plays a significant role in its geology. As Europa orbits Jupiter, the gravitational force of attraction exerted on the moon increases as it moves toward perijove and relaxes as it moves toward apojove. During the perijove portion of its orbit, Europa elongates toward and away from Jupiter, relaxing back into a more spherical shape in the apojove section of its orbit. This expansion and contraction – or tidal flexing – continuously massages Europa’s interior, creating a permanent internal heat source that permits the moon’s still hypothetical – but very likely – subterranean ocean to remain liquid. 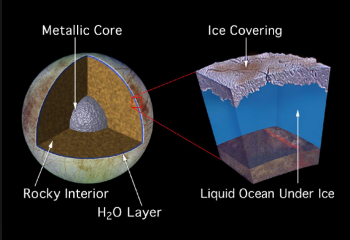 Europa’s ocean is estimated to be approximately 100 km (62 mi) thick, with the top 10-30 km (6-19 mi) frozen to create Europa’s outer crust and a liquid subsurface saltwater portion that gives Europa its induced magnetic field. The ocean itself was first hinted at from theoretical considerations when Europa’s tidal heating influences were first discovered. Telescopic, in situ, and flyby observations from Earth and space-based telescopes as well as the Voyager probes in the 1970s and the Galileo Jupiter orbiter in the 1990s have all led to an analytical argument for the existence of the ocean as well as the ocean serving as an explanation for surface features observed on the moon’s icy crust. Current theories suggest that Europa’s overall ocean carries a volume of 3×1018 m3 – or nearly two to three times that of Earth’s ocean volume. The thought and analytical evidence for a subterranean saltwater ocean on Europa has catapulted the moon into the upper strata of possibility where life in the solar system might exist off of planet Earth. While Europa is not the first moon confirmed to have a subterranean ocean – that honor went to Enceladus around Saturn – Europa is the current leading candidate for NASA and several other agencies in terms of in situ investigations of the moon and its saltwater ocean. Today’s announcement goes a long way in setting up what is likely to be a concentrated focus on the now congressionally-mandated Europa Clipper mission to Jupiter in the 2020s. Last year, the final FY 2016 federal budget included language specifically addressing the Europa Clipper Mission and the vehicle upon which it would launch. Originally, the Europa mission was penciled in for launch aboard an Atlas V 551 variant from the Cape Canaveral Air Force Station. Europa Clipper will carry three main categorical objectives: Ice shell and ocean, Composition, and Geology studies of Europa. The mission will specifically seek to confirm the existence and characterization of the ocean within or beneath the ice as well as the processes by which surface-ice-ocean exchange occur on the icy moon. Europa Clipper will additionally be tasked with identifying the distribution and chemistry of compounds and their link to ocean composition as well as characteristics and formation of surface features including sites of recent or current activity. 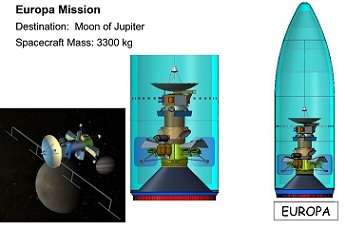 The mission itself, for radiation protection purposes, will not orbit Europa directly but will instead orbit Jupiter and dive toward Europa for several close flybys at altitudes ranging from 25 to 2,700 km above the surface during the course of its mission. Europa Clipper will also be equipped with the first ever lander designed for operational use on one of the Jovian moons.